The West Coast is home to one of the world’s natural wonders – the Langebaan Lagoon, sea fed, with the nutrient rich Benguela current running into it. The Langebaan Lagoon was once home to millions of oysters that now rests on the bottom of the ocean, covering it with approximately 30 million tons of oyster shells. The vast habitats in the Lagoon are home to whales, dolphins, rock lobster and millions of other species. Wildlife roams our various national parks and surrounding areas. Numerous animals can be visited in the West Coast National Park, Postberg Nature Reserve and the Bergriver Wetlands. The West Coast is a bird lover’s paradise. Over 50% of the birds in the West Coast breed on the surrounding islands. The Lagoon is considered a critical conservation area. The West Coast and its surrounding areas also house the endangered Oystercatcher and other species like Pelicans and Flamingo’s. 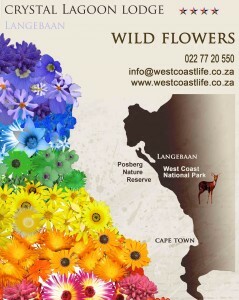 Join us for a West Coast Flower Celebration! Watch the world transform into a work of art as different colours explode everywhere around you. Discover true meaning in the remarkable flower displays, with 80 endemic flowering plant species gracing us all over the West Coast. Explore nature further, and discover the jewels of the West Coast Life.